From coast to coast, north to south, and everywhere in between, if you've been to an electronic festival anywhere in the continental United States, chances are you've come across Zoogma. 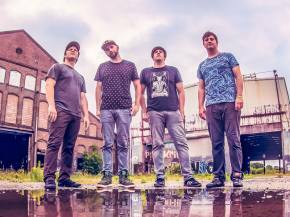 This livetronica quintet has been gigging hard for the past few years, and it has certainly paid off, with high-profile gigs at Glowing Souls and Camp Bisco X, along with this weekend's Big Up Festival and next weekend's Rootwire. On today's episode, drummer Matt Harris and keyboardist Preston Boutot discuss the inception of the Zoogma project; not only how the project came together, but how a couple of hill country blues musicans came to be introduced to spacey, trancy, eletronica in Oxford, Mississippi. Coming up in the next couple of weeks on The Untz Podcast, we'll have hyphenated bass-keteers ill-Esha and An-ten-nae on the program, as well as Bluetech, who just released an album benefitting anti-deforestation groups. Join the conversation by following @theuntzpodcast on Twitter! Today's episode was sponsored by The Big Up Festival. To download this podcast, right click Zoogma - Episode 81 and save the file.